Login to the ELC Scholarship Program. Welcome to the ELC Scholarship Program. Please enter your email address and password to login. If you are a new user, please register. Please enter your email, and your password will be emailed to you immediately. You must read the information below before logging into the system for the first time. Please register to create a profile and then "Login" to start your online application. The Executive Leadership Council (ELC) is the preeminent membership organization committed to increasing the number of global Black executives in C-Suites, on corporate boards and in global enterprises. The mission of The ELC’s Scholarship Programs is to build a pipeline of Black corporate talent by supporting the academic achievement and development of Black undergraduate and graduate students. Scholarships are awarded to students who demonstrate academic excellence, leadership and commitment to community service. In addition to receiving a scholarship award, an elite group of students will be selected to participate in The ELC’s Honors Symposium. The Symposium is a multi-day professional development experience offering ELC scholars career development and networking opportunities. Click here to view and download the 2019 ELC Undergraduate Scholarship Programs fact sheet. Applicants must complete and submit all application requirements by March 8, 2019 at 11:59pm EST. Created in honor of The ELC’s founding member, the first president and CEO of The Council and an alumnus of Howard University, the Alvaro L. Martins scholarship is open to high achieving undergraduate black male students attending one of the nation’s top Historically Black Colleges and Universities (HBCUs). A total of eighteen (18) scholarships are available. The top ten (10) scholarship awardees will receive a one-time scholarship in the amount of $8,000 each and $5,000 each for eight (8) additional scholars to assist with educational expenses for the 2019-2020 academic year. Essay Topic: As a founding member of The ELC, Alvaro L. Martins and other black executives banded together to create a community for black business leaders. They sought to create a safe space that allowed for the sharing of best business practices and ideas while serving as a collective body to address issues plaguing the development and sustainability of the black business community and educational system. They demonstrated what can happen when purpose and passion collide. The results of their efforts are still evident today, 30 years later, through the many initiatives of The ELC. As you prepare for the future, how has your passion and/or purpose influenced the career path you have chosen to pursue? What steps are you taking to fulfill that dream? Essay Requirements: Each applicant must submit a well-written and supported essay on the scholarship's specified topic of interest (essay topic will differ for each scholarship). Essays should be 500 (minimum) to 800 (maximum) words in length. What differentiates you from the other applicants and how have your experiences shaped you as an individual? What is your vision and strategy for becoming a future black business leader? Named after the first woman chair of The Council and former chairman and CEO of Young & Rubicam Brands, the Ann Fudge Scholarship is open to high achieving undergraduate black female students attending one of the nation’s top HBCUs. A total of eighteen (18) scholarships are available. The top ten (10) scholarship awardees will receive a one-time scholarship in the amount of $8,000 each and $5,000 each for eight (8) additional scholars to assist with educational expenses for the 2019-2020 academic year. What factors and trends do you think have contributed to the earning and wealth gap for black women? As you enter the workforce over the next several years and begin to have significant earnings and income, what action(s) can you take to improve your financial knowledge and well-being both in the short and long term? What information do you think would be helpful to share with your peers to increase their financial literacy? Top undergraduate students are invited to compete in a national writing competition focused on business trends, issues and insights. Sponsored by The Coca-Cola Foundation, this scholarship program is open to high achieving undergraduate black students attending a four-year college or university. Eighteen (18) scholarship awardees will receive a one-time scholarship ranging between $4,000 - $12,000 to assist with educational expenses for the 2019-2020 academic year. Essay Topic: The ELC invests and assists in the development of the next generation of black business leaders. In an effort to bridge the gap between our corporate partners and top diverse talent, what do you believe attracts the best candidates to employers? When identifying potential employers, please describe the key business principles that are most important in your selection process. What are the factors that are critical to your decision-making process? Examples: The organization's reputation, development opportunities within a company, the product or service the company provides, etc. What types of positions would you be interested in post-graduation and does the geographic location of an opportunity matter (domestic and international)? This scholarship was established to provide opportunities for high-performing, minority college students pursuing careers in engineering. The Praxair Engineers of Tomorrow Scholarship is open to high achieving undergraduate black students currently attending a four-year college or university and pursuing a mechanical or chemical engineering degree. Three (3) scholarship awardees will receive a one-time, need-based scholarship in the amount of $12,000 each to assist with educational expenses for the 2019-2020 academic year. What challenges have you overcome in achieving your undergraduate education? Who or what influenced you to pursue a career in the engineering field? Whom do you consider a trailblazer in the engineering industry? Please explain. Briefly describe your short and long-term goals (academic and career goals). How do you plan to achieve them? Please describe the types of leadership roles you have experienced? How do you intend on being a leader in your community? Essay Requirements: Each applicant must submit a short essay (500 words maximum) in response to each of the four prompt questions. This scholarship program, established with a donation from Nationwide, will provide scholarship awards to high achieving black students who are pursuing degrees in business, insurance and risk management, or a related field. Ten (10) scholarship awardees will receive a one-time, need-based scholarship in the amount of $12,000 each to assist with educational expenses for the 2019 – 2020 academic year. Essay Topic: As one of America’s most diversified financial services companies, we’re trusted advisors to our members — offering a breadth of solutions like home and auto insurance, life insurance, retirement savings tools and more. And how do we accomplish it all? By hiring and retaining associates who are as driven and caring as you. We’re a leader in the insurance industry because we’re a company where you can do meaningful work every day and where the effort you put in is acknowledged and rewarded. Join us and be something great. What factors influence you when deciding on a profession/career after college? What does Nationwide currently offer that makes the company attractive to you as a potential employer? What suggestions can you provide to improve Nationwide's brand, social presence, community engagement and user experience to ensure an optimal candidate experience for millennials/Generation Z? Please share your perspective on the importance of diverse collaboration and its impact on product innovation? Essay Requirements: Each applicant must submit a short essay (500-word minimum; 1,000 word maximum) in response to each of the four prompt questions. 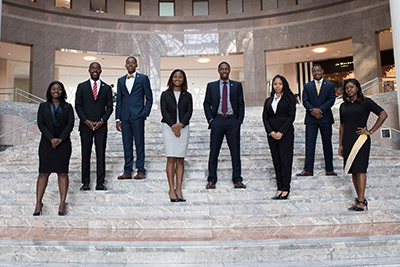 The Honors Symposium introduces The ELC's scholarship recipients to a wide range of business-related careers and industries to increase the number of future black business leaders. Our goal is to help fill the pipeline of black corporate executives from the classroom to the boardroom. The Symposium is a four-day professional development experience comprising a series of events and meetings that connect and expose The ELC’s scholarship recipients to leading corporate executives and hiring managers from major global corporations. During this experience, the scholarship recipients participate in career development opportunities and enriching social activities. The scholars also attend The ELC’s Annual Recognition Gala where they are recognized on stage before an audience of more than 2,000 corporate, education, civic and community leaders. What differentiates you from other applicants and how have your experiences shaped you as an individual? What is your vision and strategy to becoming a future Black business leader? Praxair Engineers of Tomorrow Scholarship applicants must submit a short essay (500 words maximum) in response to each of the four question prompts. Click on the Register button to complete and submit the registration form. Login to the Scholarship system with your email and password. Create your online Application. Review and accept the eligibility requirements. Before the application deadline, your application can be saved as DRAFT until all the required information is completed. As each section is complete, you will see a appear in the category tab when the application is saved. Please ensure that all attachments are in Acrobat PDF format. At any time, you can download and print your application by clicking on the icon in the Application Summary section. On completion, save your Application as FINAL. Download and print a copy of your application for your records by clicking on the icon in the Application Summary section in the right column. Note: If an update is required prior to the Call for Application close, you can make the update and resave as FINAL.